Waterlox Original Satin Finish dried with a pattern in it. What is this from? These are what are referred to as "Benard Cells". Benard cells are defined as: "defects that look as if someone has imprinted a series of hexagonal shapes on the surface of the varnish film. They may be four or five sided or even roughly circular. Often there is a mixture of these. Benard cells have very noticeable centers and are sometimes produced by convection current circulation patterns induced by solvent evaporation in paint films. 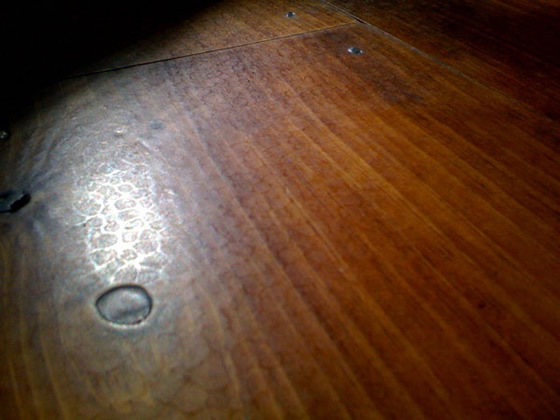 They can also be formed by leaving a physical impression in the film surface when applied by a roller. A roller will form a stipple effect on the film surface, creating areas where pigments or flattening agents in the paint or varnish, congregate and form the hexagonal pattern." To repair this, you'll need to buff the surface to remove them, vacuum and tack and apply another coat with the lambswool applicator method that we discuss on our website in the FAQ/Project Help page.